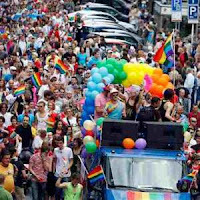 It looked like any typical gay pride parade held in America. a counter demonstrations by conservative groups. Brno the country's second largest city in 2008.
perceived "deviant" as a "neutral word in terms of value." pride festival. Hillary You Rock!! “Homosexualism” is, according to Czech President Klaus, an ideology. And a dangerous one. Among other "isms" representing fashionable ideologies that petrify the Czech president are feminism or environmentalism. Klaus is, besides a sorry bunch of neo-nazis the only Czech getting himself all worked up about this.